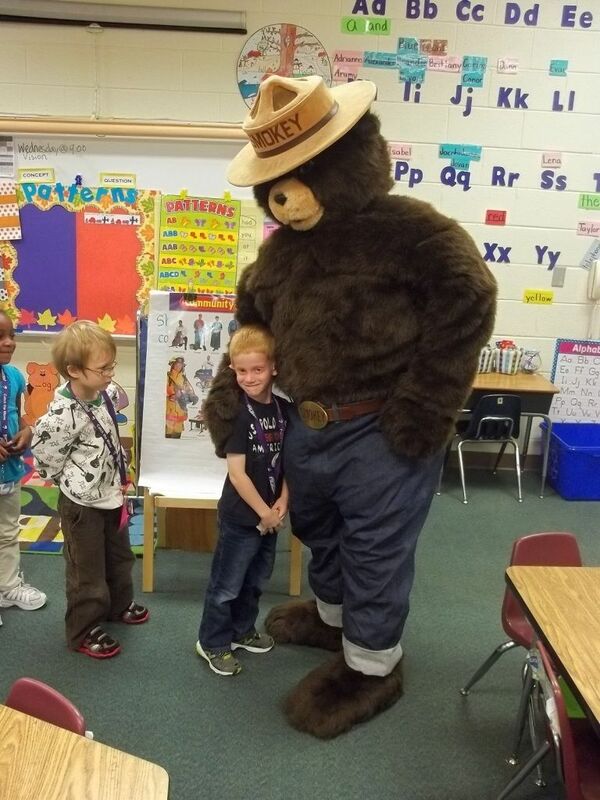 Since Evan is lucky enough to have a daddy with close ties to Smokey Bear, I foresee this as a long time tradition for Daddy to bring Smokey to his school. Daddy has done this for several of Evan's preschool classes and now for kindergarten. 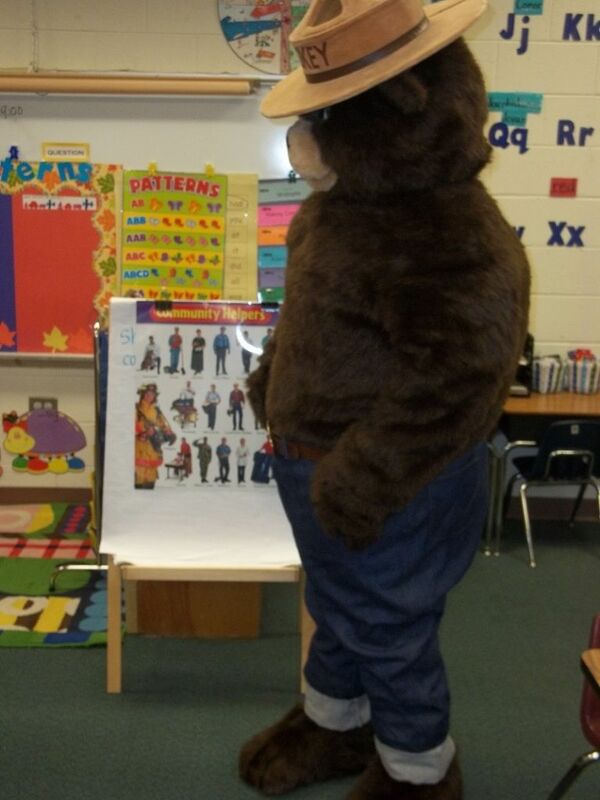 He does a lot of school programs in our county since it is the largest school system in the state. He asked the other kindergarten class teachers at Evan's school if they wanted to participate in the Smokey program, and they all refused so I say their loss. Well, the loss is really the kids' so that is actually sad, but I am glad Evan's teacher allowed this important program. I can remember learning from Smokey when I was a kid. Daddy usually gives the kids some neat treats too, including stickers, coloring books, and storybooks containing the real story of Smokey. 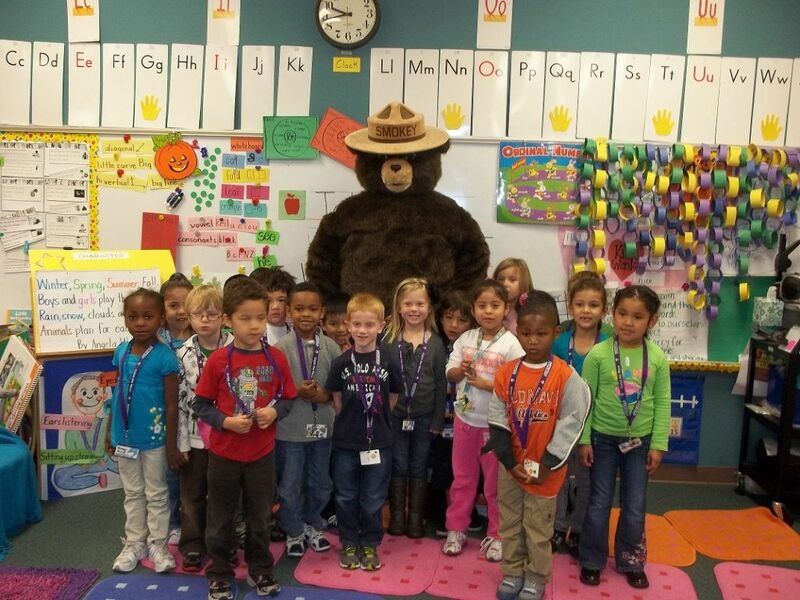 Yes, there was a real Smokey Bear! It is a sweet story. Anyway, I am thankful that Evan and his class got to enjoy a day with Smokey, and that Daddy got to visit with Evan's class and got a few pictures for me. Hi, Smokey! Welcome to Kindergarten! Awww, Evan and Smokey are long time friends. And one with Daddy Forester too! That is so cool! Evan will love having his dad come and do that with his class......until about 5th grade. My dad is/was a politician and worked in elections and voter registration. He used to always come to my school to talk about politics and voting. I loved it, until I was about 11 or 12. Then it was just embarassing. Ha ha! Ha...I guess that's why these programs stop after elementary school. :-) I would think your dad's services would be more needed (although less appreciated) by the high school crowd. I love dad's who get involved in their kids' lives and education. Eddie went with Evan today to school to have breakfast for something called "All Pro Dads." I think it is just a way to get dads more involved with school. This is so neat!!!! They were all super excited, right? I think so, Valerie. 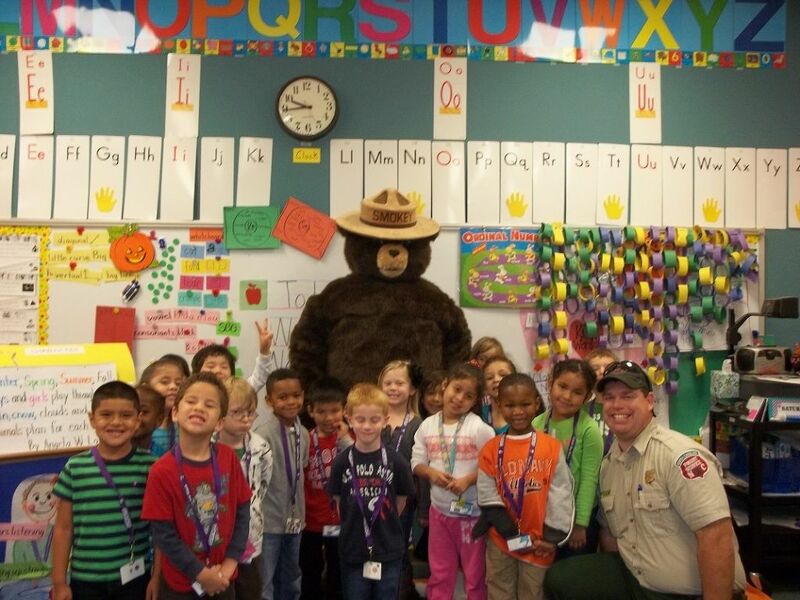 Of course, at that age, there may be those few who are still wary of costumed characters, but the teacher took all of their pictures individually with Smokey, and no one looked too freaked out. Haha! What a great tradition for Evan!! Working for the school system here- I LOVE when the Elementary Schools get BIG visitors!! That is such a great tradition. And so sad that the other classes chose to miss out. 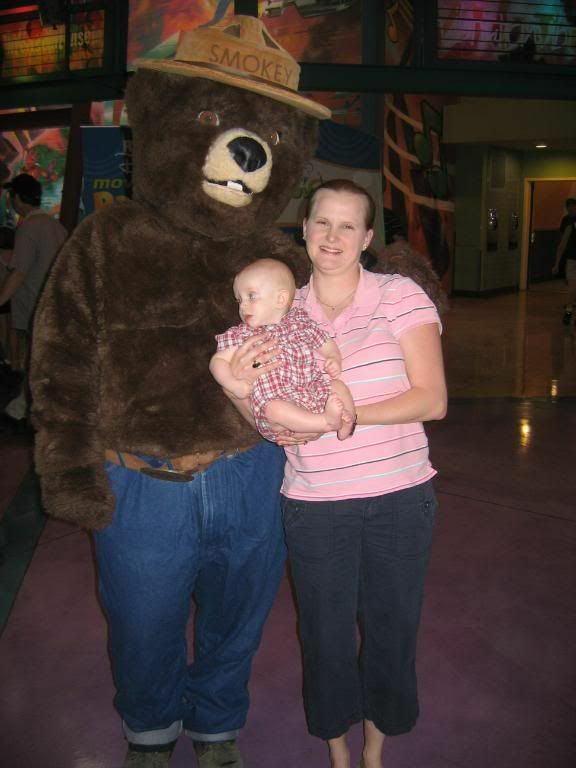 And I had no idea there was an original Smokey Bear. That is very cool! And the controversy over "Smokey Bear" vs "Smokey The Bear" is funny to me, although I think I always knew him as "Smokey The Bear."